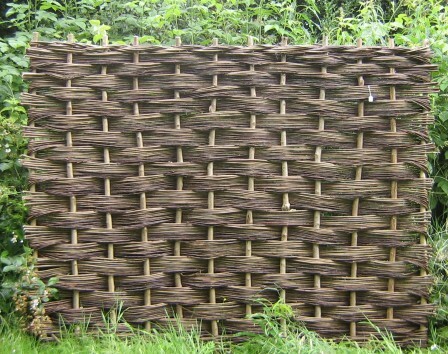 Used in the same way as hazel, willow hurdles produce a very attractive garden fence or screen. Willow rods woven around good quality robust uprights – hazel zales are ideal. There are slight variation in patterns in different regions. Willow hurdles can be brought to standard fence panel sizes or made to customer specification. Willow hurdles make ideal fences and wind breaks and climbing plants can be encouraged to grow through them. A well-made willow hurdle should last 7 -8 years untreated but can be periodically treated to extend this period. Hurdles can be easily attached to oak or chestnut posts driven into the ground making installation quicker and easier than conventionally fence panels.